It is wildebeest season again and the sounds fill the night air - the migration has officially started! 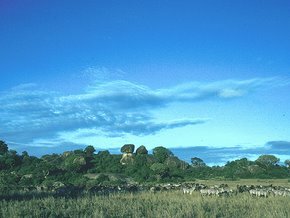 Concentrations of plains game under the acacia trees, mass together in preparation for one of the world’s greatest phenomena – the Great Migration. The stage in the Mara is now set for the world's most fascinating wildlife spectacle; the migration is on its way from the Serengeti’s endless plains to the Maasai Mara on the Kenyan side. The wildebeest are preceded by the zebra ‘chomping’ the longer grass in preparation for them. A herd of almost 2,000 wildebeest have crossed the border from the Serengeti near Sand River gate, with a similar number crossing at Roots Crossing. This head of the southern migration is taking their traditional route towards Roan Hill, while others entered the central Mara plains via the western side of the hill. The weather has played havoc with the traditional migration this year. Intermittent rain in April grassed the plains in green, which soon dried due to the dry spells in May and June. This dry and overgrown grass is now expected to slow the migration's movement northwards. Looking into the Serengeti from the Sand River, herds of zebra and wildebeest on eastern and western sides of Naima-Lumbwa Hill can be seen heading northwards. The higher concentration is south of the Mara River and Sand River confluence, with the recently burnt area being the main attraction. 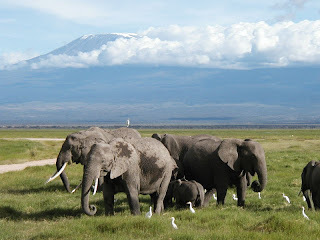 Kenya is the original home of safaris (travel in Swahili). These are a combination of different scenes, a mosaic of diverse habitats, cultures and abundant wildlife. It is a fascinating country with the greatest variety of wildlife roaming freely in the enormous game sanctuaries. History has it that Man’s earliest ancestors may well have originated here in Kenya, Turkana, northern Kenya as long as five million years ago. 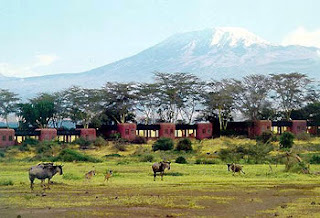 The mere mention of the word safari evokes the vivid picture of Kenya and Tanzania. For those who may want to return to Kenya for a Kenya Safaris with a slightly different twist or for the first timer who would like a more indepth look into the nature of this spectacular country. Walk on 11,000 foot mountain moorland, trek the thick forests of Kakamega and hike the acacia bush of Lake Nakuru. 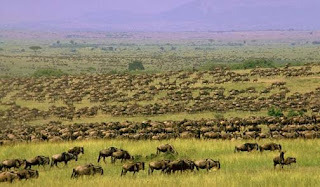 And, of course visit East Africa’s finest preserve, the Maasai Mara. This is a close-hand look at Kenya’s natural history: we’ll hope to see some 400 species of birds (including Africa’s smallest bird of prey, the pygmy falcon and it’s largest, the martial eagle) and an enormous variety of mammals, insects and plants. We are dedicated to plan your perfect personal Kenya Safaris. Kenyan safari, a common word on every adventurer’s lips. Kenya is the home of safaris in Africa. The Kenya safari trend began from the colonial times when Kenya built a reputation for its untapped nature and exotic wildlife. At the time many diehard safari fans moved to Kenya and settled in the wilderness living with nature and at the same time promoting the touch of Kenyan safari. A Kenyan safari could last a lifetime as some visitors have said because there is so much to see and experience, many places to visit. To experience nature at its best and in its original form is truly an honour and is only available if you go on a Kenyan safari. The Masai Mara Reserve is Kenya's Wildlife Paradise. You can witness the migration of thousands wilderbeasts , zebras across Kenya and Tanzania. What could possibley be more exciting than the Kenyan safari? If the jungle is too much nature for you to handle then you can go to the lakes and watch lots of birds enjoying the sunshine as you would be doing in the Kenyan safari. Lesser Flamingos are a speciality in Kenya. Thousands of birdwatchers from around the world visit Kenya every year in different seasons to go on the Kenyan safari so that they may come across several species of birds. A break from the Kenyan safari in the city for a few hours could do well if you would want to visit the snake park in between the Kenya safari. All sorts of snakes are on show alive and kicking again thanks to Kenyan safari. Something even more exciting would be to visit the museum during the Kenya safari to see some of our ancestors and what they looked like millions of years ago. The pace of a Kenyan safari is second to none and would be ideal for adults and children alike. A great advantage of the Kenya safari is that the jungle, the sun and sand and mountains are all in reach so one day could be in the jungles and other could be on the beach and the third on top of Mount Kenya. It could not possible get more exciting than a Kenya safari. Visit Kenya ‘The pride of Africa’. Hakuna Matata, Swahili for no worries! For more information on Kenya Safari and Kenya wildlife holiday options available, check with Adventure Africa Holidays who are able to arrange and customise your Kenyan trip during an African Vacation holiday travel.